Everyone hates government waste. President Trump believes it is “our moral duty to the taxpayer” to “make our government leaner and more accountable,” and his political opponents seem to agree. And yet, when called to vote on an extra $80 billion a year for the most profligate public agency in the country, the overwhelming majority of U.S. senators asked no questions. The Pentagon not only escaped serious budget cuts while everything from national parks to Meals on Wheels has been squeezed, but it actually almost got more than it asked for in the spending bill the Senate approved on September 18. The Pentagon’s latest increase alone — never mind its base budget, which runs hundreds of billions higher — is a sum large enough to make public colleges free across the country, and by itself is worth well over 80 percent of Russia’s entire military budget. It’s worth asking: Where does the money go? Consider the reaction if the Environmental Protection Agency buried evidence of $125 billion in bureaucratic waste. At the very least, we would see congressional inquiries with Republicans foaming at the mouth and Democrats solemnly stating their commitment to safeguarding your tax dollars. At most, we would hear calls for some kind of criminal investigation. This whole situation is mathematically impossible for the EPA, with its annual budget of around $8 billion, but not for the Department of Defense. In 2015, it both found and hid $125 billion of wasteful spending. 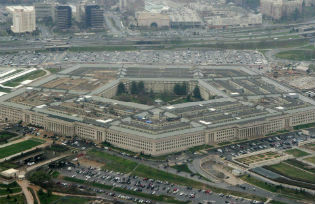 As a Washington Post investigation revealed, the Pentagon did not like the findings of its internal spending review. Its own investigators found that a quarter of the annual budget was spent on overheads like human resources and logistics. It counted over a million desk jobs, and nearly 200,000 full-time contractors in the Army alone. That exceeds “the combined civil workforce for the Departments of State, Agriculture, Commerce, Education, Energy, and Housing and Urban Development,” the Post notes — all with the fewest number of active troops on duty since 1940. If “inefficiency” is a suitable word for the Pentagon bureaucracy at home, it doesn’t come close to describing how military money is spent abroad. In the six years from 2009 to 2015, the Special Inspector General for Reconstruction in Afghanistan tallied around $17 billion in “questionable spending” throughout the country by the Pentagon, the State Department, and USAID, while the comparable office for Iraq suggested that $8-$10 billion (of $60 billion total) in reconstruction money was wasted as a result of corruption and mismanagement. • A recent audit concluded that officials at the Pentagon cannot account for $700 million spent on ammunition for the Afghan National Defense and Security Forces through 2015 and 2016. • The Pentagon spent just under half a million dollars on 20 refurbished cargo planes for the Afghan Air Force in 2008, only to find that they were so poorly equipped that they were not fit for use. “Sixteen of the planes were sold as scrap for the grand sum of $32,000,” ProPublica notes. • In 2007, the Government Accountability Office told Congress that the Pentagon “cannot fully account for” 190,000 weapons “reported as issued to Iraqi forces as of September 22 2005.” A 2016 audit suggested that the total price of lost American weapons in Iraq amounted to around $1 billion. For some officials and commentators, the solution is outsourcing. The Center for a New American Security’s Daniel Straub even argues in a recent article that “private contractors can help win the war in Afghanistan,” because “profit is incentive to do a job right.” Contractors, he suggests, can bring flexibility and efficiency, perhaps saving the taxpayer as much as $35 billion. The evidence from the Pentagon’s great outsourcing experiments suggests the complete opposite: Profit is an incentive to overcharge, mislead, and defraud. The Justice Department sued the contractor Kellogg, Brown, and Root (KBR) for overcharging in 2012; Custer Battles was found guilty of $3 million worth of fraud in Iraq as early as 2006; and although DynCorp was accused in federal court of knowingly inflating costs throughout a four-year contract for the State Department in Iraq, it maintains its Pentagon contract for “training and mentoring” the Afghan National Police and Interior Ministry. Much of the Pentagon’s new handout will go where it usually goes: into the pockets of military contractors, or else get lost altogether. Most Americans won’t discover this, and it’s hard to blame them. Their political leaders are united in their determination to protect the world’s largest bureaucracy from serious scrutiny. However, as Afghanistan war veterans watch their children go off to fight the same war they began fighting 16 years ago, the Pentagon won’t be immune forever. Then, it will have a heavy account to settle.